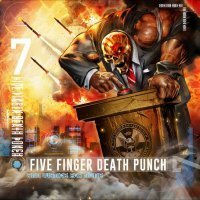 2017 was quite an eventful year for Five Finger Death Punch. The Las Vegas-based outfit spent a lot of the year involved in a legal battle with their label, Prospect Park, who cited in a claim that the band had started working on a new album without their consent. The matter was eventually resolved with 'And Justice For None' being the end result. On top of that, lead singer Ivan Moody's battle with some personal demons saw him temporarily walk out on the band during a European summer tour, his replacement for several dates being Tommy Vext (Bad Wolves). It is fair to say that 'And Justice For None', the band's eighth full-length release, is their most varied to date, both musically and lyrically. The trademark aggression is still in place, it just comes across as even more aggressive. The reflective songs that they do so well are also still evident but they are just, well, more reflective. The standard thirteen track edition contains plenty of in-your-face, up-tempo, profanity-filled workouts, epitomised by the opening 'Fake', 'Top Of The World' and 'Sham Of Pain'. Driving riffs and hard-edged rhythms are to the fore, and Moody channels as much anger as possible into his delivery. As usual the hooks and melodies are high impact and instant, and this is a feature throughout. 'I Refuse', 'When The Seasons Change' and The Offspring's 'Gone Away' offer the softer side of the band without losing any energy or emotion and showcasing some great acoustic guitar and strings alongside heartfelt Moody vocals. Kenny Wayne Shepherd's 'Blue On Black' gets the Five Finger Death Punch treatment too, and the vibe is akin to the cover of 'Bad Company', which was originally featured on 2009's 'War Is The Answer'. The band are not afraid to introduce something different to the sound, and there are several songs that include computerised effects and embellishments to underpin the guitars of Zoltan Bathory and Jason Hook, Chris Kael's bass and Jeremy Spencer's drums. As usual Kevin Churko's production brings the most out of the songs, and sonically you could not ask for anything better. There are certainly more moments of subtlety than any previous Five Finger Death Punch album, and a greater balance has been achieved. However, if you did not like them before, then this album, despite its quality, probably will not change your mind.